National Yoga Month is observed in September to educate the public about the health benefits of yoga and inspire a healthy lifestyle. The awareness campaign consists of yoga classes and other special events to celebrate the month and motivate people to practice yoga. 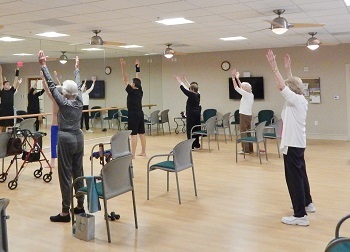 Because of the physical and mental health benefits of yoga, Edgemere, a premier senior living community in Dallas, recently began offering Mind-and-Body Yoga. The 50-minute class is held three times a week and features poses, meditation and breathing exercises. 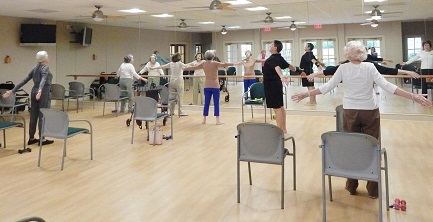 Residents can choose to either stand or use a chair instead of completing poses on the floor. The class ends with relaxation and deep breathing concentrating on the present moment. 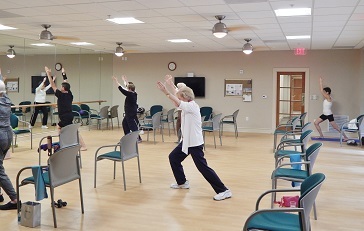 Pat Londeree has lived at the senior living community for 16 years and recently tried yoga for the first time in the community’s class. She says she’s already noticed an improvement in her ability to focus and balance. Additionally, she notes her posture has improved and she feels her muscles getting stronger.